Is the condensate pump plugged in? And just like the previous complaint of Heat pump blowing cold air, some new heat pump owners may think their unit runs all the time because they aren't used to the longer run times and lower temperature output of a heat pump. 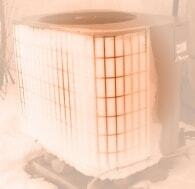 In extremely cold weather conditions, a properly working heat pump will run almost continuously. That is the way they are designed to work. Now, if it isn't extremely cold out (above 35 degrees) and your heat pump seems to run all the time, then this could indicate a problem. And along with this, usually comes a higher than normal electric bill, lower supply temperatures, and sometimes icing of the outdoor unit. Cold return temperatures... Examples include: Air handler in attic with the return trunk disconnected from unit; pulling in cold attic air. Unit in basement with a basement return and open windows.